FREE pair (2) of Breathable Pads with the purchase of your Sherpa pet carrier. Help protect your carrier when traveling with your pet. Made of durable quilted nylon with vinyl trim. The sides provide ventilation for your pet as well as privacy panels. Zippered entry from the top and side. Comes with handle straps and a sturdy, adjustable pull strap that also serves as a shoulder strap. The inside bottom has a removable and washable sheepskin liner. Zipper side pocket for storing toys and treats. Rolls flat and does not allow tilting to provide a safe and comfortable experience for your pet. Available in black and in one size only. Please measure your pet prior to ordering as it is important that your carrier allows your pet to stand up and turn around. See how to measure your pet below. Note that the carrier can compress which will reduce the height measurement. For your pet's comfort and safety and to conform to commercial airline regulations if flying, yur pet should be able to stand up and turn around in its carrier. 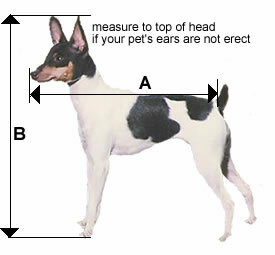 Measure your pet using the chart below. Due to State Health Laws, we will not accept the return of any Sherpa bag after a pet has been inside the bag – No exceptions. If your pet has not been inside the carrier, it may be returned for exchange or refund as long as returned in saleable condition. You can find current information for airline pet policies by clicking here. With great customer service, I returned the medium carrier for a large due to the weight of the pug ( 22 lbs). This rescue pug fits in the large one comfortably. Able to return the other one with no problems because I followed the written guidelines. Bought this carrier way before my Florida trip on get ready to return, the smaller handle where the snaps meet, did not snap. Now knowing they don't do return's for a product that I bought in good faith, now makes me apprehensive in buying anything over the Internet. I apologize about the problem you are having with your carrier. How long ago was this carrier purchased? Did you know that Sherpa has a one year warranty on all of their carriers? Feel free to contact us and we will provide details.